Earlier Monday Fritsch told CNN Chief Congressional Correspondent Dana Bash that they've found thousands of examples of voter irregularities, as well as invalid crossover votes from Democrats. The latest comments from the McDaniel campaign came just a couple of hours before the deadline for the state GOP to hand over to the Mississippi secretary of state's office the certified results from the runoff contest. 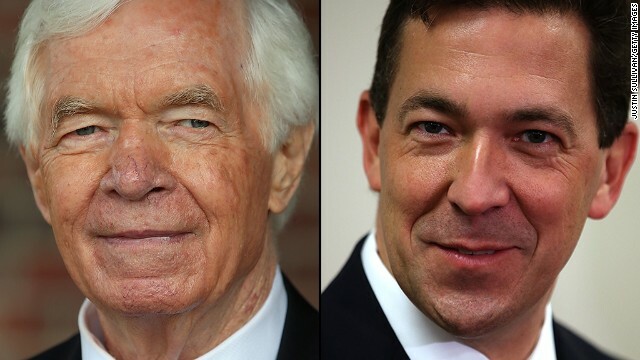 McDaniel narrowly edged Cochran in a June 3 primary, but with neither man cracking the 50% threshold needed to win, the contest moved to the runoff three weeks later, which Cochran won by fewer than 7,000 votes. The Mississippi secretary of state's office announced Monday it accepted the certified election results from both state parties. The official results from the Republican Party showed Cochran with more than a 7,600 vote lead over McDaniel. Cochran victory was apparently aided by votes from African-American Democrats, who were actively courted during the runoff by Cochran's campaign and allied groups. According to Mississippi law, voters are not required to register with a political party, and anyone who doesn't vote in a primary election can cast a ballot in either party's runoff. After the runoff, McDaniel's campaign dispatched volunteers across Mississippi to investigate the results in the state's 82 counties. FreedomWorks, one of the anti-establishment groups that's been supporting McDaniel, dispatched activists to assist the campaign. Separately, a conservative outside group filed a lawsuit in federal court asking for full access to the voting records in the primary and runoff elections. While Fritsch said there were thousands of voter irregularities, he could not provide an exact number. But he added that the irregularities they've they have found so far do not include any from absentee ballots – just votes that occurred in person in the runoff. After the runoff, McDaniel's campaign dispatched volunteers across Mississippi to investigate the results in the state's 82 counties. McDaniel said Friday on CNN's "New Day" that "the integrity of the process matters. We believe on that night of June 24 there were thousands of irregularities and we've already found thousands of irregularities in the process." "Right now, we have found we have found more than 5,000 irregularities. There are more than 19,000 absentee ballots we still haven't seen yet," McDaniel added. McDaniel also defended his campaign's offer – announced Thursday – of rewards of $1,000 each for individuals providing "evidence leading to the arrest and conviction of anyone involved in voter fraud." The Cochran campaign has disputed McDaniel's claims, and numbers. The Cochran campaign said Monday afternoon that it has representatives at all 82 courthouses to monitor the review of the ballot boxes, and that its pleased so far with the results. "The county-by-county results reported thus far are revealing an extremely low number of crossover votes from the June 24th election. As the process moves forward, the conversation is shifting from wild, baseless accusations to hard facts," Cochran spokesman Jordan Russell told CNN. "As we have said from the beginning, the run-off results are clear: the majority of Mississippians voted for Senator Thad Cochran." "Cochran challenger to take legal action against Mississippi GOP runoff results"
"His victory was apparently aided by votes from African-American Democrats"
Really? And how did CNN determine this to be the case in a state that does not have any form of voter registration by party? ""Right now, we have found we have found more than 5,000 irregularities. " Teatroll Rosetta Stone says: "irregularities" = voters with names like "Lopez", "Tyrell" and "Houshmenzadeh." "People are the problemm NOTE Chicago and Detroit and Illinois in general- A democratic controlled state from top to bottom– strict gun laws, unions in control, debt that God himself could not pay back– What's not to like? Saw this headline just now and just had to post it- "83 shot- 14 fatally- in Chicago over holiday weekend"
Yeah.. "We" just like to focus on Chicago for sensationalism.... M-Kay! "McDaniel also defended his campaign's offer – announced Thursday – of rewards of $1,000 each for individuals providing "evidence leading to the arrest and conviction of anyone involved in voter fraud." Is he indeed? Well, I wish him luck with the "wistleblowers". Apparently he doesn't have the "goods" and is reaching into thin air. Waaaaa! We lost, it must be fraud. Waaaaa! Now go drink more of that TEAaid. Noel Fritsch, spokesman for state Sen. Chris McDaniel, told CNN Chief Congressional Correspondent Dana Bash Monday that they've found thousands of examples of voter irregularities, as well as invalid crossover votes from Democrats. demorcats doing what they always do... messing with elections. this time they got caught. now you know why they don't want voter id laws. honest elections are the last thing they want. Here's a hint Mr. McDaniel- go look up the Mississippi election laws regarding "Open Primary". Now realize that the law did exactly what it was supposed to do. Go home! I guess the Neo Confederates are upset because they forgot their own laws about open primaries. So much for not being the " Party of Stupid". "Saw this headline just now and just had to post it- "83 shot- 14 fatally- in Chicago over holiday weekend"
Yeah.. "We" just like to focus on Chicago for sensationalism.... M-Kay!" You do. Nothing you said changes the statistics I cited. When you have a super high concentration of people in one place, larger numbers of incidents can still represent a lower incidence rate, i.e., a statistically lower likelihood of being shot, threatened with a gun, injured by "accident" etc. In other words, Chicago is still safer than LA as far as guns go. It's all about the denominator, champ...you do know what a denominator is, don't you? The MSM and folks like yourself like to focus on places like Chicago because bigger numbers all at once sound more sensational and provide a wonderful distraction and source of disinformation and misinformed perspective for people who don't quite grasp the simple concept I just explained. Explaining to people that places like LA are still more dangerous in terms of gun violence, accidents and injuries than Chicago doesn't sound as "seckseh" when you have to rely on smaller overall numbers and math to prove it. Much MUCH easier to just shout "ERHMAGERD....BIG NUMBER!!!!!!! LOOK OVER THERE...SQUIRRELS!!!!!" What evs? – 31,000 gun deaths in US. If 800 are from Chicago, where do the other 30,200 come from? I'm a Losser Baby ! Yes, mcdaniel offered 1,000 dollar rewards for anyone bringing forward evidence of voter fraud. I got 3,000 dollars for giving him photos of black people voting. Fascinating. So the Right was correct- by their own metric, there is voter fraud- and they know because they are committing it. Perhaps instead of restricting minority voting, we would get cleaner elections by limiting voting rights of the Right-as they seem to now be admitting their proclivity for such actions. What I don't get is why black people would vote for Thad, who pushed and voted to get rid of voter rights acts. The irony is the people who helped get him elected are the same people he tried (with success) to suppress their right to vote. But people here are stupid – so there ya go. Meaning that all you stupid people will vote for McCain..?? LOL ?? Oh look... now just saying has that same distinct spelling error of the word Democrat as does donna and just asking. Tsk... tsk.... all these righties on here are actually just one disgruntled mentally challenged welfare recipient living in a trailer park in some red state... no doubt drunk and hopped up on prescription (someone else's) meds wating for their gubmint check... they just don't think anyone else should get one. lmost likely of the other large urban crime infested hell holes where they have rendered the law abiding citizens defenseless.